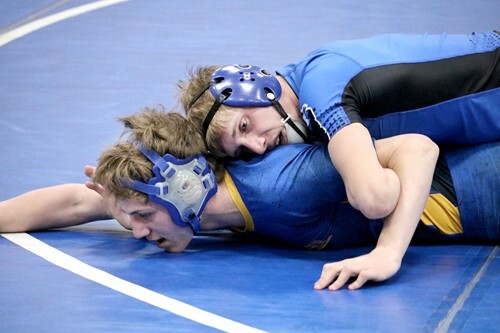 Congratulations to Hancock senior wrestler Owen Wormuth for breaking the school record for varsity wrestling victories on Monday, January 28, at Deposit High School. Owen’s first-period pin during Deposit/Hancock’s non-league match against Maine-Endwell marked his 141st varsity victory, breaking the Hancock record of 140 set by his older brother Levi. Owen pinned Cobe Sisentstein in 1 minute, 23 seconds at 145 pounds for his record-breaking win. He improved to 27-8 this season. Teammates Joey Rumola (11-2 major decision at 126 pounds) and Evan Kenyon (pin in 1:20 at 220) also earned victories for the Eagles, who fell, 42-16, to the Spartans. D/H will compete next in the Owego Class Tournament at Owego Free Academy at 10 a.m. February 2.